Jimmie Johnson is on kill mode. And rivals are stunned at Johnson's intensity level...and his remarkable cool and calmness. "He's just going really fast right now," Joey Logano marvels, one of many almost speechless at Johnson's step up to hyper-drive at Texas and apparently again here. 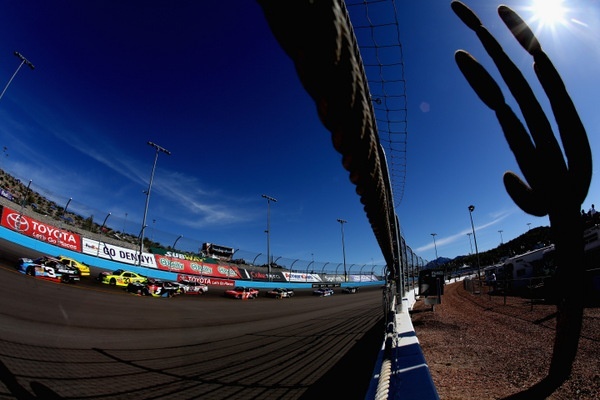 Johnson threw a couple more shovels of dirt on Matt Kenseth's championship bid Friday, taking the pole for the start of Sunday's Phoenix 500K, the next to the last race of the season, at record speed. And if the race ended now, Kenseth, who qualified 14th, would be going to Homestead next week for the season finale some 25 points down to Johnson, an almost insurmountable spread -- Kenseth would need to win Homestead, lead the most laps, and have Johnson finish no better than 20th or so. The last two years Johnson finished 36th and 32nd at the Miami track. However there are some wild cards. "Goodyear brought a new tire here, and it's not laying any rubber down," Denny Hamlin says. "And this track is hard to pass at. "Jimmie had the fastest car in practice even before switching to qualifying mode. Matt needs a few things to fall his way." Hamlin is Kenseth's teammate and has the second-best career record here...second to Johnson. Johnson? "Everyone knows they can turn it up at will," Hamlin says. And it's obvious Johnson and crew chief Chad Knaus certainly have. Goodyear has a new, more grippy left-side tire here. However drivers haven't seen much grip so far. Maybe the Truck race and the Nationwide race will lay more rubber and help widen the groove for Sunday's race. Tires were a factor in the Kansas 400 chase race. And tires were a factor in last weekend's Texas 500. To hear Jeff Gordon talk about it, tires may well be a factor here too. And Gordon isn't talking about that renowned Arizona warning about rattlesnakes sleeping under tires in the garage. Gordon spent a good part of Friday practice here scuffing tires, to get the rubber to take a heat-set, to make the tire more durable. Virtually no one does that these days, so it might be that Gordon was simply trying to make a point -- that he doesn't like the tires Goodyear brings here. Since this flat one-mile was repaved Gordon has not been alone in complaining about the tires here. The tight, polymer-asphalt used in most recent NASCAR track repaves is so smooth that it creates a lot of heat and doesn't wear the tire, a double-whammy for Goodyear. For Gordon, complaints about tires might go back a week too -- his championship hopes vanished when a left-side tires blew on the straight in the Texas 500. Goodyear says Gordon's Texas tire showed the classic symptoms of being underinflated at the start of the run. Teams sometimes underinflate a tire because air pressure build-up over a run can be high; when a tire builds up such considerable pressure, it changes the handling characteristics. But when a team underinflates a tire like that, the driver has to baby his tires until the air pressure builds up sufficiently. The tire situation here is not so much a tire situation as an asphalt issue, similar to Kansas. Gordon complained Friday "there is no grip here. It's like you're just riding up on top of the track. And the tires aren't wearing at all." One of the day's most curious stories involves Kyle Petty, the veteran NASCAR driver and now TV color commentator -- who is suddenly mentioned as a possible candidate for the U.S. Congress, with the pending retirement of congressman Howard Coble in North Carolina's 6th District. That district includes Greensboro, which with nearby Winston-Salem has the highest TV viewer ratings for NASCAR nearly every week. Petty would only play it coy here Friday, talking around the issue but neither confirming nor denying it. A more important story, though, might be the sagging attendance at many recent Sprint Cup events. 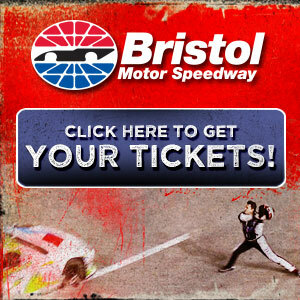 With markedly weak crowds at Charlotte, Talladega and Texas in recent weeks, NASCAR officials are scrambling to find some new rules for 2014. And there appears to be quite a battle going on behind the scenes, with the new rules -- if any -- coming out sometime after a mid-December test at Charlotte Motor Speedway. 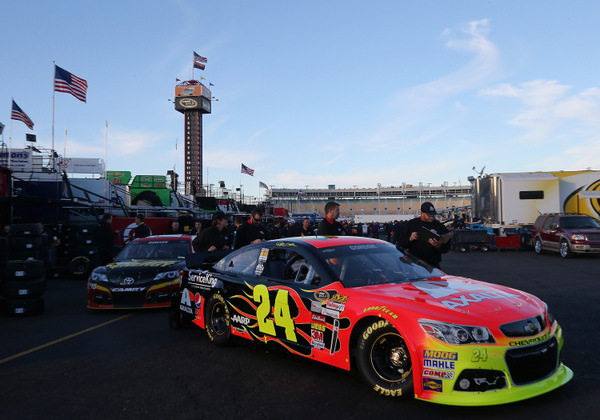 NASCAR has been on-and-off about several key points, in aerodynamics and engines. And crews and team owners are both becoming extremely upset with all the hemming and hawing and indecision by NASCAR, as well as the pointed issue of having to spend money to meet any new rules. The rich teams would obviously have an edge in dealing with any new rules. But with too many races still less than thrilling -- Johnson led 255 of the 334 laps at Texas last weekend -- NASCAR executives may feel they need to shake up the rules to persuade jaded fans that next year's racing might be more exciting. Time is becoming a major issue too, since the new season isn't that far away. NASCAR officials probably should have set the 2014 rules by late August or very early September, to allow teams to build cars. Goodyear engineers too are under the gun because of NASCAR's indecision. Goodyear is already building Daytona tires, and it would like to have the 2014 rules so it could start testing new tires. Last year, for example, NASCAR changed the rules after Goodyear held its big Texas test. Last week NASCAR told teams it wouldn't be going with speed-cutting engine intake 'tapered spacers,' which would cut about 100 horsepower out of these 900 horsepower 358s. That didn't set well at least one top team owner, who is vigorously pressing NASCAR to go with the tapered spacers. There is also a movement to require Cup teams to use an engine for at least two races, with officials 'sealing' it between the events. Presumably that would be to try to cut costs. However one engine man says that would almost certainly lead to another technological battle to find better engine 'coatings' to reduce wear. Some teams have been testing the tapered space concept throughout the season (perhaps even in some Cup cars during actual races). And there is a good body of data about the concept. Some engine men say a better idea would be for NASCAR to go to small cubic inch engines for 2015, saying they anticipate having to get an entirely new run of engine blocks late in 2014 anyway and that would create an opportunity to switch to smaller engines. The current 358s have been used on the Cup tour since the early 1970s. Engine man Robert Yates first proposed a reduction in engine size 20 years ago, but NASCAR has steadfastly shown no interest in such a move. Switching to, say, a 305-ci engine rule could cut horsepower to about 750 hp, down considerably. Worries about an RPM/valvetrain war would apparently be negated by the current NASCAR gearing rules. Some engine men here are worried that NASCAR officials haven't noticed a rash of engine failures this season. Matt Kenseth's record here over the years hasn't been great. Jimmie Johnson, on the other hand, has the best record of all drivers. But this has been a season of surprises by Kenseth, in his first season with Joe Gibbs and Toyota. And perhaps it would make more sense to consider Kenseth's potential on this flat one-mile by considering how well teammate Denny Hamlin has done here: in his three most recent runs here Hamlin has a first, second and third, for a sparkling 2.0 average. Then again, consider what Kenseth this season has done here and at Phoenix' two sister tracks, Richmond and New Hampshire, and Martinsville's flat half-mile: In those seven events Kenseth has averaged a 6.5 finish. Johnson, including that 40th at Richmond, has a 10.0 average finish in those seven. Discounting that 40th, Johnson's average jumps to 5.0. Those numbers would show that Sunday's 500K should be very competitive between the two. No matter what happens in these final eight days of the season, Kenseth is a big winner. He rightly says this is the best season of his 14-year career. He's been competitive nearly every week. And he's got a league-leading seven wins. "I don't feel I'm a different driver," Kenseth, 42, insists. "There are certain things that maybe fit your style in a car, or a situation, or an organization, or the way you go about things, or the way it feels...that will maybe make you look like a better driver. "It always looks like you're a better driver when your car is fast." Seven points, that's the slim lead Jimmie Johnson has over Kenseth, with two races to go. That's about the difference in seven finishing positions (not counting a race winning bonus). With 712 miles of racing yet to go, that's not much of an edge. And if it's possible to read these two guys right now, Friday afternoon, Kenseth appears more cool and loose about it all than Johnson. 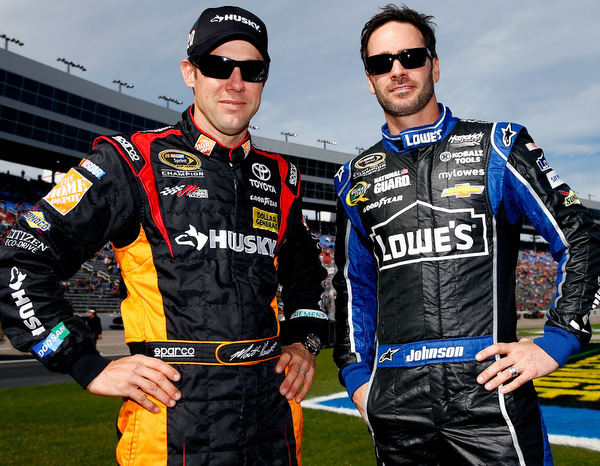 Johnson put a game face on at Texas, after getting surprised by Kenseth at Martinsville. And Johnson brought that game face right here. To which Brad Keselowski -- not in this title chase, but after last year's run, having a pretty good idea of how to measure Johnson -- says to Kenseth to run the heck out of Johnson, put pressure on him, don't let him relax, don't give him any breaks. 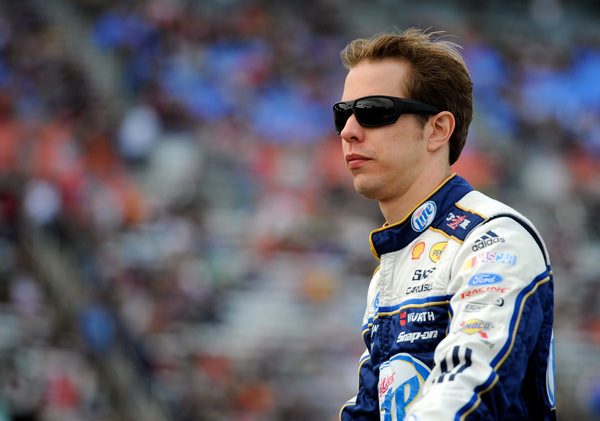 Keselowski, perhaps brashly, says that's Johnson's "weakness," that he can be pressured by racing him very hard. Johnson bristles at that: "I guess we need to ask Jeff Gordon, Mark Martin, Denny Hamlin, who else have I raced for a championship, Carl Edwards, how we race. We race hard. That is not a weakness of ours by any stretch. "Last year here they (Keselowski) were better than us for sure. We worked real hard to play catch up through the course of the weekend. Sure, we had a tire failure, and yes, we overworked the tire. We created an issue ourselves. "That is the lesson I take from last year's race here. "We love to race hard; that is what we are here to do. "I know some want to say we have been to Homestead (for a championship finale) and didn't have to race for it. But you look at our last championship with Denny Hamlin (2010) -- we had to come from behind and win down there. "Racing is what I'm good at. I'm not the best at putting up the fastest lap, or the best at qualifying, or the best at topping the speed charts in practice. But look who passes cars on the track. I'm good at racing. That is my sweet spot." Johnson, others say, doesn't play well when he's forced off his game. "Everybody wants to be the leader, but I feel good about it," Kenseth says of the title chase. "I'm looking forward to this weekend. We had a good run here in the spring; it was my first downforce race with the team. "We had a really competitive car, and we've been good at these kind of tracks." Martinsville and Loudon, N.H., in point. Kenseth says his off-season testing at Charlotte made him "really confident we were going to have a really good season... or at least we had all the ingredients to have a really good season. "It would have been hard to believe somebody if they'd said (preseason) we would have seven wins and do some of the things we did this year in our first year together... because throughout my whole career I've never been able to do that. "No matter how it ends up, it's been a great season. "Before the chase started, it's been a great season. "After we won the first two races of the chase (Chicago and New Hampshire), I said no matter what happened in the last seven, it was still going to be a great year. "If you don't end up winning the championship it's hard to not be just a little bit disappointed, because you just don't get that many opportunities to win it. "But for sure, no matter how it ends up the next two weeks, it has been an unbelievable year. It’s been one of probably the best years of my career." Submitted by codger on Sat 11/09/2013 - 06:20. Just wondering if down the road another Lance Armstrong scenario might transpire. Similar to Penske transam wins in the late sixties with the acid dipped camaros.